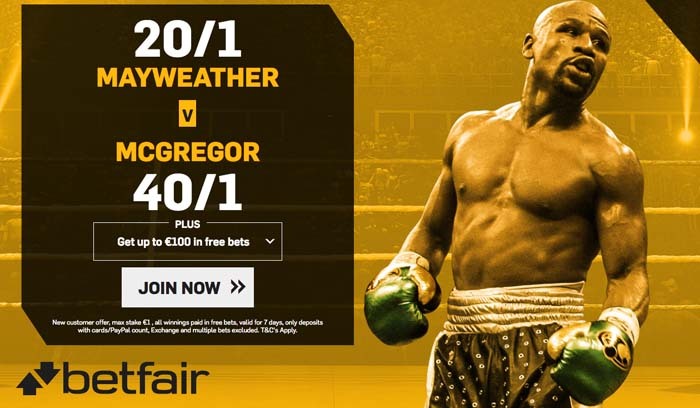 Betfair enhanced odds for the ‘Fight of The Century’! What to do to get this offer? The May/Mac big fight is just around the corner. If you don’t bet with Betfair this is the opportunity you was waiting for. Get 20/1 Mayweather or 40/1 McGregor to win and make more money with your bets in Betfair. Plus get up €100 in free bets with your bets in the house. Terms and conditions apply. Join Betfair now and open your new account using promo code ZSACBY. New Customers Only. Deposit money in your account to be able to bet. Very important: only deposits made using debit/credit cards and Paypal will qualify for this promotion. Bet (max €1) on Floyd Mayweather or Conor McGregor in the ‘Match Odds’ market at the enhanced price. All winings will be paid as free bets. Qualifying winning stake returned as cash. Exchange bets are excluded. Plus you will qualify for up to 100€ in free bets. With every 5 x 10€ bet, you will be awarded with a 20€ free bet. Do the same four times to get 100€ in free bets. See terms for examples. Free bets will be valid for 7 days and must be used on the Sportsbook. This offer is available now and will end on August 28th 05:00 hours. Place a bet on Floyd Mayweather or Conor McGregor in the ‘Match Odds’ market at the enhanced price on the Sportsbook. Max stake £1.